And it also might give you stressful flashbacks to some really maddening conversations you had during your college days. So you are warned. 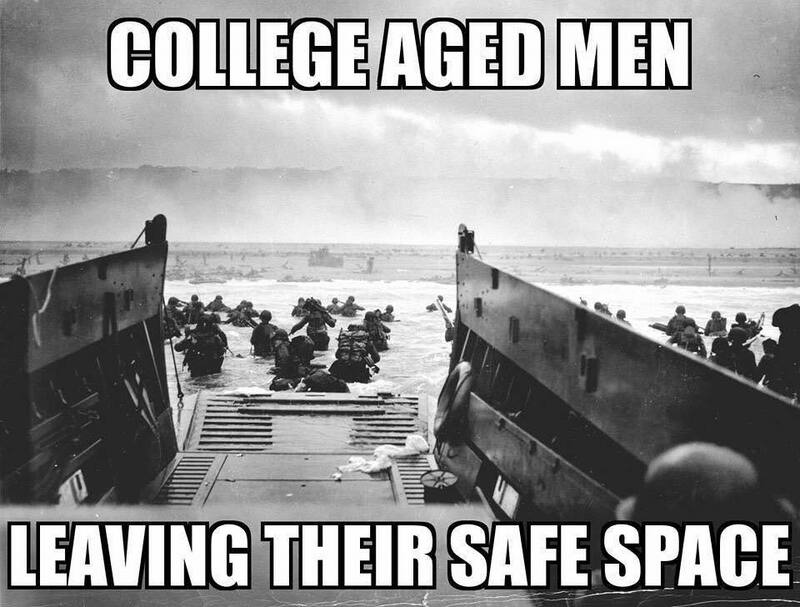 This is not a safe space. So much has been written about the newer sorts of ideological correctness on the campuses of American universities, mostly by haughty old white guys such as George Will and Bill Kristol, just harrumphing away. Or for that matter by Kim R. Holmes (don’t worry! even though the name is “Kim,” it’s another oppressor white guy, refusing to check his privilege! ), the author of The Closing of the Liberal Mind, which was was reviewed this morning in The Wall Street Journal. So unless academia is your milieu, you’ve probably only heard such terms as “trigger warnings,” “safe space,” “cultural appropriation” and “microaggressions” within a disapproving context. Basically, they read like the quotes a satirist would construct in creating fictional students who espouse the notions that The Closing of the Liberal Mind criticizes. A satirist who know nothing about these terms other than what he read by the critics. If you’re likely to harrumph along with Will, this piece isn’t going to change your mind a bit. These kids are sensitive. Just ask them; they’ll tell you. Like hothouse flowers. And they talk just like people who have a worldview that is entirely rooted in that sort of sensitivity. Fadumo Osman: When I wear my traditional clothing I’m a foreigner and I’m criminalized for it, but when you wear it you make money off of it, and it’s cute…. Liam Baronofsky: One microaggression is like one paper cut, so it’s something small but it hurts the person at the core of their identity level. But it happens so often, you come home every day with like 15 paper cuts … and it really hurts…. But perhaps you’ll disagree. Go read the story, and let me know what you think. This entry was posted in Books, Civility, Higher education, In Our Time, Marketplace of ideas, Words on May 23, 2016 by Brad Warthen.